Froggy's Fiber Followings: I get my "S" words mixed up. I get my "S" words mixed up. 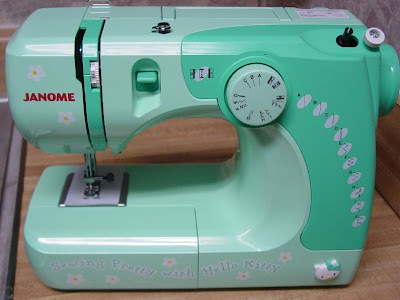 Because see, I have been wanting a new spinning wheel but this past weekend I ended up with a new sewing machine. Easy mistake though, see there is an S and a W in "spinning wheel" and "sewing machine." Some vowels in common too. So here is my new toy. Cost me 16 dollars brand new. Sometimes those big box organizations should have a little quality control in their hiring practices. This machine was supposed to be $25 plus tax. Instead there was a random shipping sticker on the box that the cashier scanned by accident. If she wasn't so busy talking to the cashier next to her, she would have realize that she rang up a DVD and not a sewing machine. As it was, I didn't notice until I was out the door, in the crosswalk, headed home. At that point, we were at the end of a day trip to Atlanta and I had just held my family hostage in the speeding car to make it to Warner Robins before they sold the last clearance sewing machine I knew of in my area. Of course the YoungMister wasn't happy (what 8 yr old is) and it was time to go home, for real. I'm sure my guilty conscience should have kicked in but it didn't. I had a tired 8 yr old, a frazzled husband, a week long search for the elusive clearance item and.... well there was just no way on this green earth I was gonna turn around and stand in line at customer service and say "Hey! Charge me MORE!" I'll just consider this a blessing in disguise.